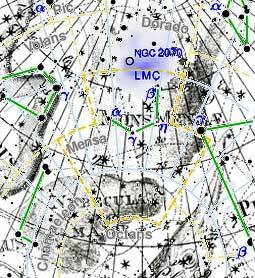 “Mons Mensa“… as every field or nature guide knows, is the Latin name of a star constellation meaning “Table Mountain” situated near the Large Magellanic Cloud, a neighboring galaxy. The constellation was named by a French scientific observer of the stars, Abbe Nicolas Louis de Lacaille, in the early 1750’s from his observatory in Strand Street, Cape Town. He is credited with having named 15 of the 88 constellations and Mons Mensa is the only one which represents a geological formation. If you visit our municipal building in Cape Town then you can see a red sculpture outside the front door which is one of the highest sculptures in South Africa. It is about 9 meters high and is made up out of industrial sections of cast steel which are cut, welded, bent and refitted to produce an abstract form. This sculpture was created by Edoardo Villa (Italy) in 1981. Most Capetonians, or visitors to Cape Town, don’t know what the artwork represents and furthermore don’t know its name. Some folk call it the “bent paper clip”. It probably comes as no surprise to find out that the sculpture is titled “The knot” as it supposedly unites all the sculptures on the landing in front of the office area. I have travelled past the statue of King Edward V11, opposite the City Hall, on many occasions before and on some of these trips not only visitors to our city but local Capetonians too, have asked me what is the relevance of this statue which is in such a prominent place in the city. Anglo Boer War he did something quite remarkable. He refused to be crowned as King of England until peace was achieved between the British troops and the Boers. This marked him as a great statesman and it is for this deed that he holds such a prominent place in our city. The weather in the South Western Cape, and in particular the Cape peninsula, differs markedly from most other South African regions in that our weather is notoriously unpredictable. This is largely due to the positioning of the Cape Mountains and the regional wind systems. Being a weatherman in Cape Town must be a most frustrating profession. Clouds that cover the tops of mountains only are known as “Lenticular” or “Cap” clouds. There is only one fool-proof weathervane in the Cape peninsula. When there is a cap cloud on Lions head, a peak in the Table mountain range, and nowhere else, rain is guaranteed within the next 12 hours. The first European to climb Table Mountain was the Portuguese explorer Antonio de Saldanha in 1503 while he and his fleet were exploring the seas between Lisbon and India. For a century after this, Cape Town was known as “Agoada do Saldanha” – The watering place of Saldanha. Many years later, a Dutch admiral, Joris van Spilbergen made landfall about 100km up the west coast and thought that he was in Agoada do Saldanha. This is how Saldanha Bay got its name even though the Portuguese explorer had never set foot in Saldanha Bay. After this naming, the original watering hole became known as Tafel Baay. There was a time when the whole of Cape Town’s main road viz. 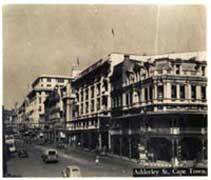 Adderley Street was made out of wooden blocks or tiles. These tiles were eventually covered with the tarred road that we have today. 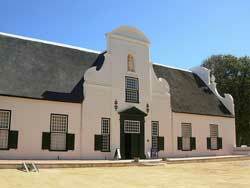 If one visits our very interesting Cultural History Museum in Cape Town a display of these wooden tiles can be seen. When one travels in the northern suburb areas one can visit the areas called Panorama and Plattekloof (Flat hill) When one does this it is rather funny to see that that the area on top of the hills overlooking the beautiful Cape Peninsula is called Plattekloof while the area below the hills with no view at all is called Panorama. The reason for this is that when the title deeds to the area were issued the local municipality made an error and exchanged the names around accidentally. Till today the mistake still exists and the areas still have the wrong names. 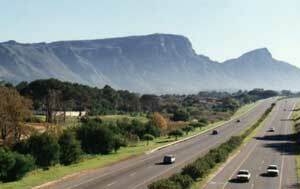 In Cape Town we have a highway that is traveled on by most Capetonians that is nicknamed “The Blue Route”. The real name of the highway is “The Van Der Stel Highway”. It is also known as the M3. The question arises as to where the nickname of the Blue Route comes from. The answer to the above poser lies in the fact that when the original plans for the highway were drawn up, the highway was drawn on the plans in a thick blue pencil colour and someone started calling it the Blue Route. The nickname got very popular and it even led to a local shopping mall being called the Blue Route Centre. On the outskirts of Cape Town we have a northern suburb called Durbanville. Just recently I found out where the name of Durbanville came from and I found the reason for the naming of this little suburb rather amusing. In 1836 Sir Benjamin D’Urban, the governor of the Cape, granted the request to the villagers of the above mentioned area which was then known as Pampoenskraal (Pumpkin village) that they could call their village Durban. In later years the name was changed to Durbanville so as to distinguish it from the city of Durban in the province of Natal. The first telegram sent from a venue in Cape Town was delivered in 1860. A building, named Woolvens Pagoda (because it looked like a pagoda), was erected on the one corner of the Grand Parade. This structure would serve as the first telegraph office in Cape Town. A Mr. Pickering installed the first telegraph line which stretched from Woolvens Pagoda to Simonstown. It was Pickering himself who sent the first telegraph from Cape Town. It was addressed to Governor General Wynyard and it crossed the prime distance of about 400 yards as the governor general was housed in the Castle at the time of the mail being sent. served in this area. 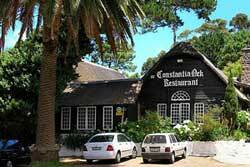 This room soon became what then and today is known as Constantia Nek which not only was famous as a restaurant but also as a dining/dancing venue on weekends. The forced removals of the local Cape Coloured population from District 6 in 1966 is what most people remember the area for. I wonder how many Capetonians know that the first forced removals, on the basis of colour from District 6, took place in as early as 1901. It was in this year that the African people (Black) staying in District 6 were forcibly removed to Ndabeni so as to allow for “poor whites” to stay in the area. When the Cape Town municipal area was demarcated into 6 districts in 1909 other areas of the city also had District names. In that way the area today known as Loader Street was known as District 5. It was in this fashionable area that most bankers and insurance men stayed. The area was renamed Loader street as this was the first road to be completely restored in District 5. Much has been written about District 6 in Cape Town but I wonder how many people know that District 6 originally was called District 12. In 1840 the town of Cape Town was demarcated into 12 districts and the area now known as District 6 was then named District 12. In 1867 it was decided to change the demarcation and the town was split into 6 districts. District 12 then became what today is known as District 6. During this period the area also was nicknamed Kanaladorp. In 1909 the City of the Cape Town was split into 8 wards and the District 6 area was renamed Castle Ward, however the name just did not stick and District 6 remained the preferred name for the public of Cape Town. Strictly speaking the area today is called Zonnebloem, but once again the name is not used by the local Capetonian public in preference to the name of District 6. It truly seems as if the spirit of District 6 will never die for the local Cape Town community. Now the question is whether anybody who reads this knows where the old District 5 is in today’s makeup of our city? 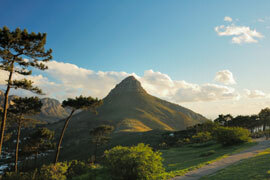 On a daily basis most Capetonians pass or see Signal Hill from wherever they are in the city. It always fascinates me to hear why Capetonians think the hill is called as such. Most say that it is because the noon gun fires a signal from hill. This answer would be incorrect. The reason why the hill is called Signal Hill is because in bygone years a signalman was permanently stationed on the mountainside which has a great vantage point over the whole of Table Bay. The signalman’s duty was to warn the castle of the approaching ships that were coming into the harbour. When ships were sighted a coded system of flags and cannon shots were used to provide the relevant information about the ship as well as it nationality. Amongst others a shot was fired for every ship that was spotted and a flag was hoisted at the same time of the shot being fired. When the ship was visually identifiable a red flag was hoisted if it was an enemy vessel attacking the harbour. This signal brought every man to the harbour so as to defend the shoreline. The first motor car to be used in Cape Town arrived on South African shores in 1898. The car was a Royal Enfield Quad and was imported by a Mr.W. Jenkins who was a manager of Garlicks Cycle Supply, which was a department of the Garlicks Store. The car was later sold to Sir Alfred Hennessey. Many people pass the Lutheran Church in Strand Street and only some notice the swan emblem above the entrance to this magnificent building. This sculpture was designed by the well know sculptor Anton Anreith and is representative of the teachings of Martin Luther who became the spiritual heir to the Bohemian priest and martyr, John Hus. The origin of the swan emblem is a very interesting one. The word “Hus” in Bohemian means goose. When Hus was burnt at the stake (1415) he spoke the words “Today a goose roasts but in time a swan will arise which nothing will destroy”, hence the origin of the insignia. I wonder how many folk know where, when and how the University of Cape Town really came into being. 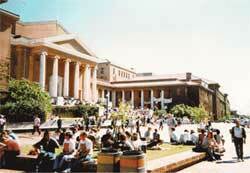 The University of Cape Town was born in the vestry of the Dutch Reformed Church in Cape Town on 14 October 1828. Heads of families all got together and discussed how better schooling could be obtained for their children as government and free school standards were on the decline. The outcome of the meeting was the opening of the South African College at the Weeshuis or Orphanage on 1 October 1829. 100 students attended school in this venue until The South African College was built. This school in turn superseded the Cape Town University on the slopes of Devils peak. We have a wonderful Supreme Court building that faces the Lions Head mountain area. If you ever see the building give the following a thought: Why does the building face in this direction and not in the direction of Queen Victoria Street which would then mean that a view of the beautiful tranquil company gardens would be enjoyed? When the original plans for the court were submitted the plans showed that they would face Queen Victoria Street which would mean facing the opposite direction as to what the building faces today. The reason for the “turnaround” is that the Chief Justice of the Cape at the time of the building of the court, Lord De Villiers, saw the plans beforehand and he found that his office faced the late afternoon sun as well as the lively atmosphere of the adjacent road called Keerom Street. To avoid this he had the plans reversed and hence the building faces in the direction that it does today. In 1620 and English seafarer, Humphrey Fitzherbert, landed at what he called the Bay of Soldania (Table Bay) and in the best British tradition promptly took possession of the area in the name of his king, James I. In a short ceremony on shore he sportingly presented the bewildered Khoi people with an English flag, thus apparently making the exercise perfectly legitimate. He then set about naming the surrounding mountains. First to be honored was the present day Signal Hill, which was christened ‘King James his mount’. What was later to become Lions Head he dubbed ‘Ye Sugar loafe’. Not about to miss an opportunity to achieve ever lasting fame, he named the present day Devils peak, ‘Herbert’s Mount’. Unfortunately, on his return to England, King James showed scant enthusiasm for his latest possession and it was left for the Dutch to move in. When the Dutch sailor, Jan van Riebeeck arrived in 1652 with few more than a 100 souls, he landed at ‘Leeuwenstraat” (Lions Tail) – the present day Granger Bay, which of course was attached to ‘De Leeuwenbergh’, the Lions rump. Herbert’s Mount became Windebergh, but over five centuries and in many languages Table Mountain has always been seen, and surely will always be seen, as Table Mountain. I wonder how may of you are aware that the Cape Glass Company, established in 1902, at Glencairn was destined to be the most advance of its kind in the Southern Hemisphere. The initial projections were that it would produce 8 million bottles per year. But alas, production and suitably qualified labour recruitment problems forced the factory into closure in 1905. Not a lot has changed in almost a century. All that remain of the old factory today are archeological remains and glass fragments. Cape Town’s first recorded tidal wave. Molteno reservoir at the upper reaches of the city has quite an illustrious history. The existing reservoir, that supplies Cape Town with water, is in fact the second Molteno reservoir to be constructed and completed 1866. In 1822, the original reservoir burst its banks, causing a tidal wave of water to rush down into the city demolishing houses, uprooting trees and generally wreaking havoc in its path. It’s amazing what we in Cape Town can survive. In 1898 a certain Mr. R.Salie submitted plans to the council to construct a mosque in Quarterdeck rd in Kalk Bay. A place of worship was needed to accommodate emancipated slaves from Batavia, Malaysia and other Eastern countries. At first a tiny house was used for the purpose, but was later changed into an acknowledged mosque. To date, no mosque, larger than this one has been built in South Africa. Cape Town has been the venue for numerous medical firsts, the most notable being the 1st heart transplant by Dr Chris Barnard. Dr James Barry who arrived in Cape Town 1816 did another notable, but far less known achievement. This good lady doctor who, despite the name, was the 1st female doctor to receive her degree, at the age of 17, at the Edinburgh University. Dr Barry performed the 1st ever-recorded cesarean birth in 1826 in Cape Town. Dr Barry died aged 71 1865 while occupying the post of Inspector general of the British Army. In the early 17th century Mr. Samual Silverthorn Baily came to Cape Town to create the first civilian hospital in the Cape. Lord Somerset granted the land on which the good gentleman was to build the hospital. He subsequently built the Somerset hospital across the way from the now very well known V&A waterfront complex. The hospital was however not his only contribution to medicine. Mr. Baily also started the 1st medical insurance scheme in Cape Town, which was also the first ever, scheme of its kind on the continent of Africa. The oldest statue of a public figure in Cape Town is that of Sir George Gray, Governor to the Cape 1854-1861, and is to be found in the company gardens at the top of Adderley Street in Cape Town. Sir George was also the foundation stone layer of the Cape Town Public library, to which he donated 5000 volumes, the collection which holds his name today. The one and a half life-sized, marble statue is of Sir George holding a book. 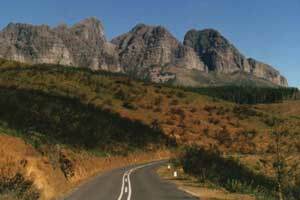 Many of our famous mountain passes in the Western Cape are a result of the incredible work done by Andrew Gedis Baine and his father Thomas Baine. The very famous Bains kloof heading North out of Cape Town is just one of Andrew Gedis Baine projects. Andrew Gedis Baine is also well known for building the 1st pass in SA, the Outeniqua pass. However another lesser known achievement of the famous Baine family and also this weeks fascinating info is the Baine’s Kloof tunnel. Did you know that this was the first transport tunnel, at 336′ long, ever built in South Africa and that it was built with absolutely no mortar but only stone packings. Last week I told you about Sir George Gray, Governor to the Cape 1854-1861, and his invaluable contribution to our national libraries. Just a few of meters away from the Cape Town library, is another landmark that owes its origin to the esteemed governor. Queen Victoria street, the avenue leading up from the supreme court to the planetarium, in Cape Town, ends in a short climbing hill named Grays pass. According to the roads surveying department of the Cape Town municipality, this “Mountain Pass” was surveyed in 1898 with the survey of company gardens, and is still on official record as a “Mountain Pass”. The pass is approximately 250 meters long and climbs approximately 50 meters from bottom to top making it the shortest “Mountain pass” in South Africa and therefore also in Cape Town. Muizenburg post office was the 1st in Africa to receive airmail. On 27 December 1911, Evelyn Driver, considered to be a superb “instinctive navigator” and also a pioneer of British Royal mail service, delivered by air, 729 Specially designed postcards to this post office. The flight from the Cape Town suburb of Kenilworth, 12.8 km flight distance from Muizenburg lasted 7.5 Minutes and was flown in a Bleriot Monoplane. Did you know that this legend actually started at Cape Town’s very own Cape Point on the Southern Peninsula in 1641. The story is told of a certain Captain Hendrick van der Decken who battled against a storm rounding Cape Point on his way home. Even though his severely battered ship started sinking he vowed that he “would try, even if it took till judgment day” to round the Cape. There have been many “sightings” of the phantom ship with torn sails and broken masts, but the most significant sighting was on July 1881 by a midshipman on the HMS Berchante. This young lad was eventually crowned King George V 1907. When you look up at Cape Town’s majestic Table Mountain you will note the remains of 3 “blockhouses” dotted around Devil’s Peak. The buildings served as a very important part of Cape Town’s defense in 1795. The buildings where built as per the instructions of governor Sir James Craig and where named the Kings, Queens, and Duke of York respectively. But did you know that the Kings served later as a convict station. One of Cape Town’s first prisons. On 21 Feb 1850 the British government was coerced by the people of Cape Town to divert a convict ship destined for the Cape to the convict settlement in Van Diemens Land in Tasmania. Sir Charles Adderley, a member of the British parliament, championed the cause of the Cape colonists. As a token of gratitude the Municipality of Cape Town presented Adderley with the considerable sum of 100 pounds and named the city’s main street after him even though he had not, and never did, set foot in this city. It is very hard to believe that the Cape Town beach of 1652 was located on the line of the present day Strand Street as this street is approximately 1km from the sea. The entire area between Strand street and the present day harbour has all been reclaimed since just before World War II. No wonder, the name “Strand” is derived from the Dutch word that means “beach”. There are 2 prominent statues of this renowned leader in Cape Town. Apart from his prominence as a guerilla leader and two times prime minister, Smuts was largely responsible for the establishment of the Royal Air Force and the League of Nations, which later led to the formation of the united nations for which the drafted the Covenant of the UN. He also wrote a number of philosophical works and was the first to first to use the term “Holism” referring to holistic healing. Knowing the time in the dead of night is something we take for granted as we can simply look at an illuminated watch and read the time. 300 years ago, our Dutch forefathers never had this luxury and a solution had to be found. After all, they could not simply pop outside and read the “Moon dial” like they would have used a sundial. A device called a “Water Watch” was used, which utilized an accurate dripping system calibrated for 13 hours of drip. A floating cork would indicate the time, usually starting at 6pm. and lasting to 7am. The nighttime hours when a sundial was ineffective and an hourglass to cumbersome. An example of this kind of clock, dated 1697, used in Cape Town during that era, can be found in our Cultural museum in Cape Town. In Cape Town we have a cannon, called the Noon Day Gun, that is fired every day, except Sundays, to signal 12:00 Noon. The “Noon Day Gun” has not always been fired at “Noon”. The tradition of the midday firing is derived from a Dutch East India company practice, which continued for over 200 years, when a gun was fired at 6am and 9pm to signal the start and end of each day. From 1865 it was fired at 13:00. Only since 4 Aug 1902 has it been fired at noon, from Lion Battery on Signal hill above Cape Town city. This very well known lighthouse is the oldest in the country and is also the “Lighthouse services” head office. The odd thing about this landmark is that the Lighthouse services head office has not always been in this building. These offices have in fact, until 1993, been in Johannesburg of all places, making it the only lighthouse service head office in the world that was situated 600km from the sea. The earliest record of a British vessel to be wrecked on our treacherous Cape coast is a galleon named “Joanna” that sank of Quinne Point in 1682. 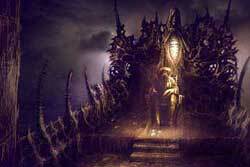 The ill-fated vessel had 70 chests of treasure on board. Fortunate salvers managed to recover 300 KG of gold and other priceless articles in 1982. Did you know that electric lights were used on April 13 1895 to light the streets of Cape Town for the very first time. The first light to be installed was on top of the pole in the centre of the fountain in Rondebosch. This pole was also used to tie horses to. Those of us old and colonial enough will remember the little coin called the “Tickey”. This very common, small silver South African coin, was actually a 3-penny piece and because of its diminutive size gave rise to the word “Tickey” being commonly used for things small. A very well known example being a very famous midget clown performing in a South African circus. A lesser known point, is the origin of this word “Tickey” which actually originates from a Malay word tiga, which means three – Hence the 3-penny piece. Have you ever wondered how Bree Street got its name? The name is actually an English derivative of the Dutch word Breë that means wide. This particular street was, in the mid 18th century, built much wider than all other streets in Cape Town so that the ox wagons could perform a u-turn in the street. Early photographs of Bree Street show that the present day islands, in the center of the street, were only added in the early 20th century. You have probably visited the wine estate Groot Constantia and thus seen the majestic old manor house once occupied by Simon van Der Stell. I however wonder if you are aware of the unusual circumstances that led to the unusually large roof and windows of this historic building. In 1792, whilst Hendrick Cloete still owned the farm, he decided to enlarge and improve the homestead. 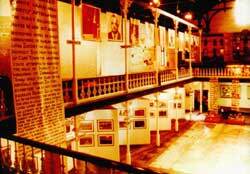 Initially there was a flat roofed gallery behind the front row of rooms. Cloete had the roof of both gallery and rooms removed and replaced with a traditional thatch roof. The new roof however now spanned 14 meters of building, double the width of a traditional house of the time. As a thatch roof requires a pitch of 50 degrees, to remain waterproof, the height of the roof therefore had to be doubled as well. Now that they were doubling the height of the roof, the existing walls would have been far to low to be in proportion, so they extended the height of the walls and the existing casement windows were replaced by tall sash windows. The next problem was that the front gable had to be heightened to match the size of the huge side gables. This left a large blank space above the gable window. Conveniently this was filled by a niche now containing a statue of Abundance with her horn of plenty. It would have been so much easier had Cloete just stuck to tradition but then alas we would not have this majestic building today. The Khoisan people who were at the Cape some two thousand years ahead of the Bantu tribes tell the story of the first silvertrees. The Great Man who formed all living creatures, gave seed to the birds, the animals and to some of the early Khoisan people telling them to find a perfect spot to grow this very special tree. After some time had elapsed the birds came back to the Great Man saying that they had dropped the seeds in the center of the land but it was too high and too cold and all the seeds died. The animals said that they had dropped the seeds on the west coast but it was too dry and all the seeds died. When the Khoisan returned they told the Great Man that they had held the valuable seeds in the palm of their hand while they traveled to the southern most point of the land. There they had found a great flat mountain and in their excitement of being there they allowed the seeds to slip from their hands onto the sandy slopes of Table Mountain. The seeds were nourished by the clear mountain springs and the fresh air that abounds in that area. The Khoisan people told the Great Man, not only did it grow and thrive but the leaves turned to silver showing that in all the land this is where it wanted to be. The silvertree is part of the Protea family ( Leucadendron Argentum ) and is found only on the slopes of Table Mountain at a height of 250 meters ( 800 feet ) above sea-level. It grows best in a sunny position that has well drained acid soil. 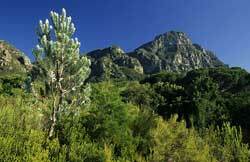 The silvertree is an endangered species of the Western Cape fynbos biome. Part Fact part Legend The Silvertree’s leaves will only turn silver when the tree can SEE Table Mountain but this explanation I reserve for the day that you join one of my tours. If you have been fortunate enough to visit the Cape Point reserve, you will have seen these two concrete beacons with stone crosses on top. These two beacons where erected in 1965 to serve as a memorial to the great discoverers after which they are named. Another more subtle application is that they are also used as navigational beacons. For a ship in False Bay, once aligned with these two beacons and a beacon above Simonstown gold course, is warned of the submerged Whittle rock in the Bay. Because of this maritime usage, the Dias beacon is painted black on the Eastern side to offset the white concrete against the horizon. The oldest living tradition in Cape Town is the firing of the Noon day guns at Lion Battery on Signal hill. The two cannons that are fired daily at noon have been in continuous use since 1806 when they were first fired at sunset, then later at 13:00 and then even later at noon as it is still done today. This continuous usage makes these canons the oldest smooth bore muzzle loading guns, in daily use, in the world. As of 1st August 2002 the guns had been fired 61760 times, truly making it the oldest living tradition in Cape Town. Did you know that there was a station in the heart of Cape Town called Monument station? Well, thanks to the Spier wine estate in Stellenbosch, who offer steam train excursions from Cape Town to Stellenbosch, the Cape Station terminus has been named Monument Station, which commemorates the original Monument Station on the now long-defunct Sea Point suburban railway line. This clipper, famous for its unique figurehead of a witch called Nanni, had two direct connections with Cape Town. The vessel was known as a ‘Tea cutter’ and was built to beat the speed of the vessel called Thermopoli which one can see the remains of off the Mouillie point beach. The other connection to Cape Town is that in 1816 the vessel suffered mast damage, in one of its speed dashes against the Thermopoli, and had to put into Cape Town for emergency repairs. Did you know that the word Cutty Sark is word of Scottish origin which means short shirt. It is therefore not surprising that the figurehead of Nanni is dressed in a Cutty Sark. Few Capetonians are aware of the exquisite architectural jewel in the middle of Kommetjie, built a half a century ago, by a grieving widow in loving memory of her husband, Joseph Rubbi. The Rubbi chapel, considered a “reckless extravagance” by the priest of Fish Hoek, was built by dedicated Italian craftsmen in 1948. The tiles, altar and sanctuary are of Italian marble, fashioned by expert craftsmen. The woodwork, pews, doors and fittings are of superb quality that could only be achieved during an era when time taken on a project was not an issue. The chapel is complete with a domed ceiling in which three painting are set, one dating back to the 15th century. A real architectural artistic secret right here in our midst which just has to be seen to be believed. We all know that most big cities of the world are situated on rivers. London is on the Thames and Paris is on the Seine, to mention just two of many. The question is “Is Cape Town situated on a river and if so what is it called.”? The answer is “Yes” and it is called the Fresh River. This is a river that comes off the slopes of Table Mountain and runs through the company gardens. It can be seen at the gates of Tuynhuys just off Government Avenue. The river then travels down underneath Adderley Street and continues to the Waagenaar reservoir below the Golden Acre. The river might be a small one relative to those quoted above, but never the less exists. There is a student’s residence called Driekoppen at the lower end of the UCT campus, next to the Baxter theatre. Contrary to popular belief, this residence is not call by this name because there are three tall building loosely referring to three heads. The name has a far more gruesome and ominous origin. In 1724, a colonist by the name of Behr was murdered at this location by three slaves. The slaves were tortured and on confession they were decapitated and their heads were placed on poles at the site of the murder. Presumably this was to be a deterrent to anyone who might have considered a similar crime. I believe it worked! It is quite unusual for Capetonians to think of our beloved mountain as a crash site for aircraft. Not so for the unfortunate Mr. Fred Duk and pupil pilot Mr. Williams. These two intrepid aviators took off from Brooklyn aerodrome, today known as Ysterplaat, on 15 May 1932. After flying across to Muizenberg the two returned back to the city via the top of Table Mountain. It was a favourite antic at the time for pilots to skim over the top of the mountain and dive down the front face. Unfortunately for them on this fateful day they were caught unawares by a swirling downdraft and their Avro Avian aircraft crashed into the rocks between Platteklip gorge and McClear’s beacon. Rescued by climbers, the two aviators escaped reasonably unscathed with one losing three teeth and the other fainting when he saw the wreck. The aircraft was a total wreck and thanks to the cable car, the two pilots where able to make it back home without any further mishap.